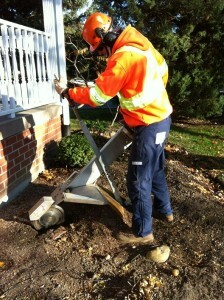 Stump grinding machines are employed to shave or grind tree stumps to various depths below ground. The surrounding area remains undisturbed so that restoring the landscape is an easy task. Stumps in raised planters are not a problem for the specialized stump grinders of Four Seasons Tree Care.